Take a gander at Pringles.com sometime, and behold the quiet empire of potato chips: Before you even get to a real site, you must select one of 23 possible home countries. Who knew the chip-maker had such a grip on the world's population centers? Resistance, at this point, seems futile—best to try the varieties that have been test-marketed for other localities outside of our own. 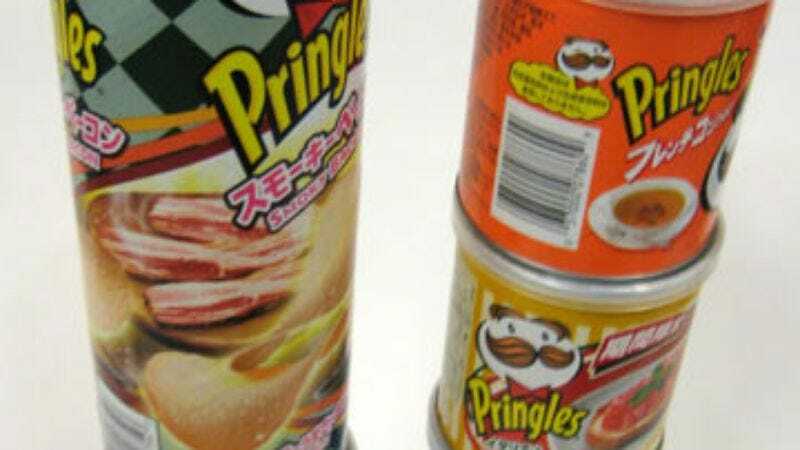 Oddly, Japan isn't one of the countries on Pringles.com; apparently Pringles has its eyes focused mostly on the South Korean and Chinese markets. These are the kinds of places that devour soup-flavored Pringles without a second thought. While the mind reels at the possibilities of Pringles technology in the hands of the Japanese, we must make do with the chips they import. My trip to Japan introduced a few new flavors to the Pringles canon: the aforementioned consommé, Spanish Salsa Pizza (like Taco Bell Mexican Pizza, in chip form! ), Bruschetta, and two types of bacon flavors: Smoky and Cheese & Bacon. At best, they were unremarkable (the consommé again); at worst, they were flinch-inducingly gross (Cheese & Bacon). Most of them fell into that mediocre medium ground: not bad, not that great, but you'd probably eat them if they were sitting in front of you. You wouldn't enjoy the experience or feel good about it, but hey, it sure passes the time. The flavors tended to hit hard quickly, then disappear. While some testers wanted to spit out the Cheese & Bacon the second it touched their tongues, after a moment's wait, they wound up chewing on that flavorless mush that all Pringles become. — "These are like pizza-flavored potato chips. Don't they do that already?" — "It actually tastes like tomato—like fresh tomato." — "These are more than adequate." — "These are tremendously tomatoey, with a generic Italian-spice flavor. It's like eating Pringles dipped in concentrated tomato soup. Not bad, but kind of overwhelming. They could totally market these in America as TOMATO EXXX-TREEM!" — "See, in Japan, junk food is classy." — "This tastes like nothing." — "No, it tastes like ramen." — "It tastes like nasty French onion soup—or the weird aftertaste to French onion soup." — "Yes, the world needs a chip that tastes like something that doesn't taste like much of anything. These are okay… vaguely like chicken bouillon. Maybe a little hint of lemon?" — "The chip is crispier than regular Pringles." — "It's like if you want soup, but you don't own a microwave, you get these." — "It tastes like Lipton soup mix sprinkled on Pringles." — "This is also unnecessary, I think." — [Sniffs canister] "Cumin! That's what it is." — "These actually just taste like a milder form of the bruschetta chips. They're tomatoey, but they aren't as strong. I'm not getting 'Spanish pizza' so much as 'some powdered tomato and oregano.'" — "It has a very light chili taste." — "I thought the bite would be bigger." — "There's nothing to it—it's like if Lunchables made a taco." — "Has anyone explained to Pringles Japan that pizza doesn't come from Spain?" — "Yeah, it's not good." — [Pointing to picture on tube.] "I like how unappealing the bacon is on the packaging." — "It's a strong cheesy first bite." — "Ooh, that is nasty." — "It's very smoky. It tastes like nitrates." — "That's ham. That's not bacon." — "It has a really heavy pork flavor to it, and a nasty government-cheese flavor as well." — "Oh God, what kind of cheese is that supposed to be? Toe cheese? These are awful. They're sour and smelly. Even bacon can't make that better." — "This will prove whether the cheese or the bacon was the objectionable part of that last one." [Eats a couple.] "Oh, it's the cheese." — "They're very Bacon Bits-like." — "I'd eat that, but I wouldn't feel good about myself." — "I have a hard time conceiving of eating more than a few of these." — "There's a lot of smoke. It's really seasoned and salty." — "It's amazing. I love it. But I don't know if my review would hold up after 10 of those." — "This doesn't taste like bacon at all. I don't know what it tastes like." — "This is killing my love of potato chips. They could have tennis balls in those tubes, and they'd taste just as good." — "Ugh. Someone filled a Pringles tube with the raunchy liquid smoke from the Bacon Mints. Just what the world needed." Where to find them: Like we keep saying, eBay. But those fragile Pringles chips probably don't hold up well during intercontinental shipping.